A thread to discuss the Cold war at sea. Chuck Baker is a veteran US Navy submariner who served on fast attack submarines in the 1980's and later served as a surface warfare officer in the early 1990s. Chuck's background is in applied engineering and he holds a Master's Degree in Mechanical and Aerospace Engineering. He currently works at NASA's Jet Propulsion Laboratory as a senior systems engineer and is a team member on NASA's Mars Science Laboratory. FIRE AT SEA, THE TRAGEDY OF THE SOVIET SUBMARINE KOMSOMOLETS (NATO: MIKE) is a remarkable book about a remarkable submarine. Written by D.A. Romanov, the deputy chief designer of the MIKE, and copyrighted in 2006, the book (hereafter ROMANOV) provides detailed technical information on the design characteristics of the MIKE that could not have been published during the Soviet era. It is not the purpose of this article to review ROMANOV but to discuss several important conclusions that are based on information in the book which were not specifically addressed by the author. As discussed in ROMANOV, the MIKE was lost when a fire in the aft-most compartment (seven) melted non-metallic connections in the high-pressure air and hydraulic lines allowing their release into that compartment which resulted in a (quote) blast furnace (end quote) with estimated pressures 20 times normal and combustion temperatures at least a high as 1600 (F), (ROMANVOV, pp. 103). Those conditions caused the titanium pressure-hull to recrystalize and burn through (breach) to permit flooding. Sea water near the stern was observed boiling. The resulting flooding had progressed from compartment seven as far forward as compartment three when the MIKE sank down by the stern at 1708 local on 7 April 1989 in the far northeastern Norwegian Sea (73-43-17N, 13-15-51E). When the MIKE sank, five men were still onboard. Four entered the escape sphere in the sail which could not be released, probably because of the stern-down attitude which would have prevented the sphere from rising from its vertically-mounted containment area. According to the single survivor, that stern-down attitude increased sharply before lessening as the MIKE sank toward the bottom at a depth of 5530-feet. The survivor from the sphere stated (ROMANOV, pp. 171) that (quote) suddenly, there was shock beneath us, like a bomb exploding, followed by a second vibration. (end quote) Although there are alternate explanations for these two events, the most likely – not discussed in ROMANOV – is bottom impact, first by the stern and then by the rest of the submarine pivoting on the grounded stern. This sequence of events, which leveled the submarine – as confirmed by subsequent imagery and observations from Soviet MIR submersibles – released the escape sphere. If the MIKE impacted the bottom 10-degree down by the stern and sank at about 13 knots, a value determined for the USS STERLET (SS-392) during an instrumented sinking on 31 January 1969, then the two MIKE bottom impacts should have been separated by two to three seconds. The released sphere – designed to hold the entire crew of 64 – rose to the surface in (quote) one to two minutes (end quote) where the pressure-seated topside hatch blew open (because of over-pressure within the sphere) permitting the survivor to escape. (A weight/displacement analysis suggests about three minutes.) Another man, who also was ejected, died from his injuries while other two – including the Commanding Officer - in the sphere were either moribund or dead. They had failed to connect their emergency breathing systems and were overcome by toxic fumes and the atmospheric overpressure within the sphere which increased the toxicity of the fumes. The sphere, which then flooded and sank, was subsequently located about 300-feet from the MIKE wreck after rising and then sinking 5,500-feet. If the MIKE sank at 1708 local and had the same 13-knot sink-rate measured for the STERLET, bottom impact should have occurred about 1712, a value consistent with then Soviet press reports of the surfacing of the sphere at about 1715. The normal maximum operating depth (test-depth) for the titanium-hulled MIKE was 1020m (3350-feet) with a never exceed depth of 1250m (4100-feet), and an estimated pressure-hull collapse depth of 1500m (4,900-feet). Page 175 of ROMANOV shows the photograph of a clock recovered from the MIKE wreck in 1992 and now on exhibit in the Russian Naval Museum in St. Petersburg. That clock stopped at 17:22;30 or about 10 minutes after the probable MIKE bottom impact. This circumstance indicates the area within the MIKE pressure-hull where the clock was located did not collapse until subjected to a pressure of 2,460 psi for those 10-minutes. Although the design pressure limit of the MIKE interior bulkheads (specifically those contiguous to compartments six and seven was 142 psi (ROMANOV pp. 102), the clock provides clear evidence that one bulkhead survived temporarily at about 17 times that pressure. During the instrumented sinking of the STERLET, the torpedo room bulkhead – the only sealed compartment – collapsed at a depth of 1200-feet, three times the test-depth of the pressure-hull. The energy released by that event was equal to the explosion of 840 pounds of TNT at that depth. Chapter 2 of COLD WAR SUBMARINES by Norman Polmar and K. J. Moore states that (quote) the end (torpedo room) compartments of WWII US diesel submarines were rated at 1,100-feet to facilitate the use of the McCann rescue chamber (end quote) mated to the escape trunks in those compartments. See Note (1). The STERLET keel was laid down on 14 July 1943. During a 1993 Russian survey of the MIKE wreck-site, a 20-foot hole was noted on the starboard-side of the first compartment, the torpedo room. These circumstances indicate the clock was recovered from the torpedo room through a hole in the pressure-hull or was ejected through that hole and was recovered from the bottom. It is concluded the MIKE torpedo room bulkhead could withstand the same pressure as the pressure-hull for the same reason as the STERLET design: to provide a refuge for those crew members unable to enter the escape sphere who might then be rescued via the MIKE forward escape trunk. The Romanov information indicates both the torpedo room pressure-hull and the bulkhead between the torpedo room and the second compartment survived at a depth of 5,530-feet for about 10-minutes before collapsing. It is probable the MIKE torpedo room pressure-hull and bulkhead collapsed nearly simultaneously because the shock-wave from the first collapse event would have propagated through the pressure-hull to the site of the second collapse at the speed of sound in titanium (19,900 f/s or 13,600 mph). Already stressed beyond design limits, the second collapse site could not have withstood the shock-wave from whichever site collapsed first. Based on an estimate that the hole in the torpedo room pressure-hull was about 30-feet forward of the torpedo room bulkhead, the shock-wave generated in the pressure-hull by the first collapse would have reached the site of the second collapse – and triggered that collapse – in about 0.002-seconds, or about three times faster than the velocity of the water-ram expanding at supersonic velocity through the torpedo compartment from the site of the first collapse. The K-8 sank, down by the stern, with 52 of the crew still on board. They had previously been evacuated to a Soviet surface ship but were ordered back on board by the “Beach.” Shortly thereafter, the K-8 – on the surface in rough seas – lost stability and sank. Analysis of the acoustic signal (bubble-pulse frequency) indicated the NOVEMBER collapse event occurred at a depth of 2,020-feet (900 psi) with an energy release equal to the explosion of 1,050 pounds of TNT at that depth. Based on the MIKE and STERLET data, that event is assessed to have been the collapse of the NOVEMBER torpedo room bulkhead and/or the torpedo room pressure-hull. The published test-depth of the NOVEMBER Class was 985-feet. Since it is probable all modern Russian submarines have torpedo room bulkheads with the same depth capability as their pressure-hulls, and also have a reserve buoyancy greater than the volume of the torpedo room, the breaching of the torpedo room pressure-hull by a weapon and the flooding of that compartment – even at significant depth – will neutralize the the submarine's ability to fire forward torpedo tubes but will not necessarily result in the loss of the submarine if the torpedo room was sealed prior to weapon impact. The empiric relationship that exists between the volume of a collapsing structure and the bubble-pulse frequency (the alternating compression-expansion cycle of air contained within the collapsing structure) permits determination of the depth of the event. In turn, that depth value and the bubble-pulse frequency provide the size of the energy release – expressed in pounds of TNT – required to create that frequency at that depth. Such forces are produced when potential energy in the form of hydrostatic (sea) pressure is converted almost instantaneously to kinetic energy, the motion of the water which enters structures that collapse at great depth at supersonic velocity, e.g., 2,600 mph in the case of the USS THRESHER (SSN-593) which collapsed – without prior flooding – at a depth of 2,400-feet. In the case of the NOVEMBER, all internal structures in the unflooded torpedo room were destroyed in less than 0.04-seconds as determined from the frequency of the collapse event bubble-pulse. When the USS SCORPION (SSN-589) collapsed at a depth of 1,530-feet, the engine room “telescoped” into the auxiliary machinery section a distance of about 50-feet. The frequency of the SCORPION collapse event bubble-pulse (4.46-Hz) indicates the telescoping occurred within no more than 0.112-seconds which equates to an average velocity of about 300-mph for the forward motion of the engine room. As previously discussed, submarine pressure-hull collapse events that occur at great depth occur too rapidly to be perceived by those onboard. This article is based entirely on unclassified acoustic data and information recovered from documents in the public domain. (1) USS SCORPION (SSN-589) RESULTS OF NOL DATA ANALYSIS (U) (NOLTR ser 69-160 of 20 January 1970) states that the STERLET after escape trunk collapsed at a depth of 9,100-feet. The forward escape trunk collapsed at 10,300-feet. "Blind Man's Bluff" is a good read of submarine espionage in the Cold War. Edited by Rick, 20 January 2019 - 0548 AM. Playing the game 'Phantom Doctrine' the other day, I was made aware of this disaster I was previously unaware of. Its instructive of some of the problems the Russian Fleet has that were laid down in Soviet times. Edited by Stuart Galbraith, 20 January 2019 - 0610 AM. How were those Backfires to be used answered. Interesting that Soviet Naval aviators were more VVS than Navy. Ah yeah, I read this some months ago, stupidly I didnt link it up. Its very interesting isnt it? Great digging, RETAC, keep 'em coming! I posted this once before, but its a very interesting coverage of the 1973 naval standoff in the Mediterranean during the Yom Kippur War. There are also some interesting details about previous standoff's between the 6th Fleet, the Royal Navy and the 5th Eskadra. The Walker spy ring is deemed to be the most damaging in USN history. Why? because the man was a radioman! "Soviet spy chief Boris Solomatin offered a more nuanced perspective when author Pete Earley interviewed him in Moscow nearly ten years after Walker’s arrest. Refusing to compare the Walker case with that of former CIA counterintelligence officer Aldrich Ames, another high-profile spy for the Soviet Union, he observed that agents must be judged on the content of the information they deliver. Ames provided the names of Russians spying for the United States and thus affected the KGB-CIA espionage war. Ames’ information “would have been used to identify traitors,” he said. “That is a one-time event. But Walker’s information not only provided us with ongoing intelligence, but helped us over time to understand and study how your military actually thinks.” John Walker had been the Soviets’ key source on Navy submarine missile forces, which Solomatin viewed as the main component of the American nuclear triad. " US Navy procedures "helped": "This research focuses on just one of the systems compromised by John Walker himself: the Fleet Broadcasting System (FBS) during the period 1967-1975, which was used to transmit all US Navy operational orders to ships at sea. Why was the communications security (COMSEC) system so completely defenseless against one rogue sailor, acting alone? The evidence shows that FBS was designed in such a way that it was effectively impossible to detect or prevent rogue insiders from compromising the system. Personnel investigations were cursory, frequently delayed, and based more on hunches than hard scientific criteria. " All of which enabled the Soviets to read USN traffic and discover a horrible secret, their shiny new SSBNs of the Yankee class were being trailed regularly! I might have posted this before, all on the development and evolution of the Grumman F14 Tomcat. "Based on the extreme damage within the recovered first compartment of the K-129, it appears the 5000 degree (F) missile exhaust plume expanded almost instantly throughout the K-129 after the launch tube was breached. This conclusion is consistent with the destruction of documents and equipment Project AZORIAN was intended to recover from the 100 foot mid-ships section of the K-129 had that section not been lost as it was being raised by the HGE, i.e., such material and equipment were exposed to the 5000 degree missile exhaust plumes for a total (both missiles) of 190 seconds." "This assessment of the K-129 missile launch support system suggests that if current Russian SSBNs have a similarly robust launch system survival capability, they may, as discussed above in BACKGROUND, be capable of ripple-firing all missiles even if the crew has been killed or incapacitated and the platform has sustained significant battle damage. Further, the stand-off distance provided by Russian double-hull construction, adds significantly to the problem of making a successful mission-ending attack on currently operational Russian SSBNs with conventional weapons." There was a documentary on azorian that claims that in the wreckage they found the warhead of a Soviet nuclear tipped torpedo. Which surely was worthwhile even if they didnt recover anything else. Its worth searching the CIA FOIA website, I found an absolute ton on there on the performance and capability of Soviet Submarine. There was an even a study there on acoustic conditions in the Norwegian sea. Edited by Stuart Galbraith, 23 January 2019 - 1318 PM. Blind Mans Bluff seem to indicate that a lot of people thought raising the boat was ineffective and that getting machines and code books from the control room was a better avenue. Not remotely enough of an engineer to to have an opinion. There was a suggestion made at the time a better option would be to build an ROV, a bit like that used by Dr Ballard a decade and a half later, and use that to cut into the control room and retrieve any useful material. They might have been right. It would certainly have been a lot cheaper and less obvious. "The ultimate success story of the ASW squadron was when a Soviet Echo II-class nuclear submarine was picked up by an Atlantic Command submarine outside the Med, trailed through the Strait of Gibraltar without losing contact, and passed to the ASW squadron. Once in the Med, contact was alternately maintained by submarines, P-3s, and the ASW squadron. Contact was passed from the submarine to the P-3s to the ASW squadron and back to the P-3s. If the ASW squadron lost it, they would tell the P-3s and the submarines, and the submarine that was in trail would get the ASW squadron back on contact. They tracked them for ten days. The ultimate act was on 28 August 1976, when the skipper of the Echo II got mad and ran into the side of the USS Voge. The Voge, the Koelsch, the McCloy, and P-3 aircraft were out there and had been tracking the submarine all the way from Gibraltar to the vicinity of Crete. Every time this Echo came up to periscope depth, he saw one of these ships around. For some reason, he thought that the ship that was tracking him was the Voge. The Voge was just a communication link. It wasn't a towed-array ship, but they all looked alike. So he decided the Voge was the ship that was causing him all this grief, and he came up to periscope depth and saw the Voge way off on the horizon. The Moinester, which was closer really had the array. But he didn't think the Moinester was his problem, because he hadn't seen it before. When the Voge started to run, the Echo II came up alongside, about 600 yards out, ran with the Voge for several miles, and then just turned right towards the Voge and ran into it. Tore part of the propeller off the Voge and punctured the hull back there in one of the after compartments, after steering." The Soviet Echo II class SSGN K-22 was finishing up operations in the Mediterranean Sea near Crete. On 28 August, 1976 the boat was 150 miles to the south-west of the island when it came to PD at 1628. The commander spotted the Knox-class frigate Moinester (FF 1097) in the periscope. The captain immediately estimated bearing and range by eye, bearing 183 relative, range 40-50 cables (in reality, B192 R20 cables). Instead of breaking off, the captain decided to maintain contact for training. At 1636 the boat dove to 140 meters, turning on C110 10kts and began to close the American frigate. The water depth was 2900 meters, SS 1-2, wind 280 3m/sec, visibility daytime unlimited. The captain of the submarine considered himself as detected by the frigate and maneuvered and varied his speed in order to carry out a break away maneuver. Thanks to his incompetent actions he created a poor sonar environment for his sonar and received spotty data from the targets, and didn’t have a clear view of the surface situation. Maneuvering on a parallel course with the Moinester, distance became 17.5 cables, unacceptably close (course 050). In these conditions, he came to PD three times – 1650, 1738 and 1753 – and never saw the second frigate. The submarine captain gave the verbal order to quit updating the log, did not sound a general alarm, did not share the data on target movement with the XO, the Nav or the tracking party. He constantly made mistakes in estimating distance and more than once approached at high speed into the skip zone (3-5 cables) from the frigate Moinester. At 1753, the captain detected the frigate bearing 062 relative, 7 cables and turned sharply left, beginning a zig-zag maneuver. The SSGN continued on a general heading of 320 at a depth of 4-5 meters, exposing the sail above the surface of the water. Because of the zig-zagging and the vibration produced by the violent maneuvers, observation through the periscope was difficult and the captain lost sight of the frigate several times, finally losing contact at 1815. Ten minutes later, unexpectedly for him he saw a second American frigate at very close range. At 1825 the commander of K-22 gave the command “Emergency deep” and “Down periscope”. These measures were too late and the SSGN plowed into the port side of the frigate Voge a minute later at 17 knots under the helo hanger. The blow was struck by the bow of the boat and followed up with the forward part of the sail. The boat received huge dents in the hull, cracks in the bulkheads and a damaged screw. The Voge lost way and was towed at first to the base in Crete and to Toulon, France for repairs in September. 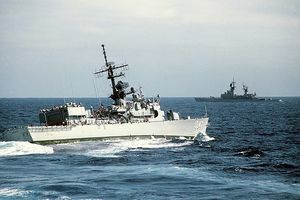 The Soviet boat suffered damage to the bow on the outer hull and the sonar dome for the “Kerch’” system was damaged as was the “Argument” missile guidance antenna. 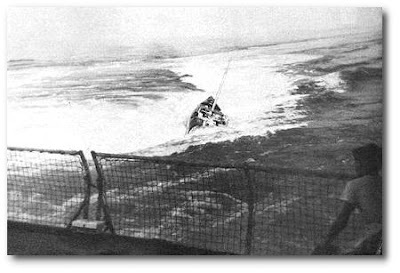 The boat had to surface and departed the area of the accident under its own power while being escorted by Soviet ships. Emergency repairs were conducted at Kithera anchorage and after than the boat returned to Severodvinsk for major repairs. Edited by RETAC21, 11 February 2019 - 1507 PM. I wonder if the subtext there is decision making after 10 days of high stresss and no sleep. Edited by DB, 12 February 2019 - 0916 AM. This is good, audio is not fantastic but worth persevering. If he fires one, I'll fire one. I can remember watching that scene on TV from a re-run of The Bedford Incident many years ago and have never forgotten it.